Admiralty Residency Hotel is a 3-Star hotel situated at 1B Tourism Road, Admiralty Estate, Lekki. It is a go-to destination for business lodgers because of its closeness to Lekki Free Trade Zone (LFTZ). While Admiralty Residency Hotel is close to the Lekki city centre, the immediate surrounding of the hotel is peaceful and free from the noisy bustle of the city. All 20 rooms at Admiralty Residency Hotel are painted in earth-toned colours and fitted with gleaming floor tiles categorised into: Standard, Deluxe, Admiral and Superior. Each room is fitted with an air conditioner, a refrigerator, a flat-screen TV with satellite reception, a wardrobe, a work desk with a chair and designed with an en-suite bathroom. Free WiFi access is available in the lobby and rooms. Some rooms have Jacuzzi. Admiralty Residency Hotel serves free breakfast to guests. The on-site restaurant offers full board meals from a variety of local and continental menu options. The bar is well-stocked with a variety of alcoholic and non-alcoholic drinks. Guests can enjoy workout sessions at the well-equipped gym. In addition to the complimentary 24-hour front desk and room service, laundry/dry cleaning and car hire services are provided at extra costs to the guests. On-site and nearby parking is available. Trained security personnel guard the premises. Cancellation: Cancellation and prepayment policies vary according to room type. Children: As there is no capacity for extra beds in the room, children cannot be accommodated at the hotel. Q: Does Admiralty Residency Hotel offer free Wi-Fi? A: Yes, free Wi-Fi is available throughout the premises. Q: Does Admiralty Residency Hotel have a swimming pool? A: No, there’s no swimming pool available. Q: Does Admiralty Residency Hotel offer complimentary breakfast? A: Yes, breakfast is complimentary. Q: Is there a fitness centre/gym at Admiralty Residency Hotel? A: Yes, a gym is available. Q: Does Admiralty Residency Hotel have a restaurant? A: Yes, a restaurant is available. Q: Does Admiralty Residence Hotel have onsite parking? Is it free? A: Yes, onsite parking is available. Q: Can you cancel your booking at Admiralty Residency Hotel? A: The cancellation policy defers according to room type. Q: Does Admiralty Residence Hotel allow pets? Admiralty Residency Hotel is a budget hotel in Lekki, Lagos. It was just a normal hotel experience, nothing special happened. The room was okay, the toilet was clean as expected and the bed was big and laid with clean sheets. There was adequate security for life and property at the hotel. I had a fantastic stay at the hotel and their staff were friendly. The room was neat, there was water, power supply, wireless service and the meal was delicious. I enjoyed my stay at the hotel and will visit again. The hotel is very clean and central, we had no issue at all finding it, it's a perfect place to enjoy. Great location, friendly staff,the room is small but has everything you need, the bed was firm. The price was inexpensive. I was surprised on how clean the room was. Wonderful hotel with a high level of security and good service quality. I would go back next time. Thank you! Well, I can't say about d guests that rated them 100% in year 2016 but now, the hotel is worse. Though the environment is cool and the rooms are okay, there is no light. They do put off the light in the morning to save diesel. Just imagine! If you lodge in the hotel, it is at your own risk. There is no intercom in the rooms. The hotel is one of the worse place I have ever been to in Lekki. The management are just a scam. Beware of scams please. The people that comes here to say sweet things about the hotel, works with them. The check-in was fast and the hotel's receptionist was helpful. 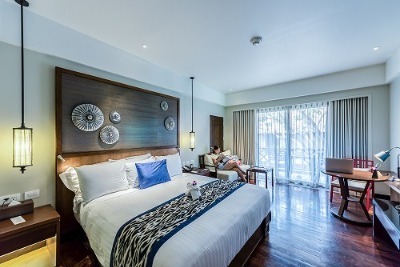 The room is spacious, clean and with a comfortable bed. The bathroom was also big and nice. Have nice pictures of Admiralty Residency Hotel?